The Salt City Shakers All-Star travel team is made up of players from all four home teams (Bombers, Cleavers, Dealers & Sisters). The Shakers play teams from other leagues. 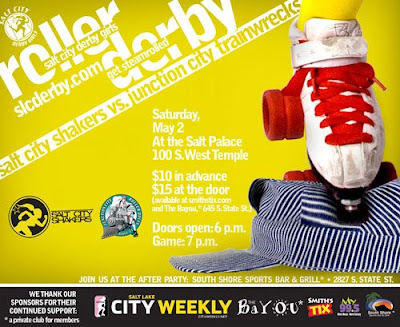 This Saturday the Shakers' season kicks off as we play Junction City Roller Girls from Ogden. History will be made on Saturday as this will be the first (of hopefully many!) inter-league bouts with teams from Utah. The Shakers will also be playing the Fabulous Sin City Roller Girls from Vegas in June and then we'll take it on the road as we face Junction City in Ogden, and Reno and LA at their home turf. We are super excited about our roster this year and are looking forward to a terrific season. Get all the details at the Salt City Derby Girls website. Plus, we have these amazingly shiny, new yellow jerseys. You won't want to miss it! Wow, I didn't realize how much you guys travel. Good luck! Post bruise pictures for us as trophies! Wooo hoo! I can't wait for the game tomorrow. Ogden is going to get taught a lesson!